We sailed along the eastern coast of Sardinia and past the Costa Smeralda, the playground of the rich and powerful. Size does matter here as each super yacht we saw grew in size and opulence. The great thing is that once past this area there are lots of free and well protected anchorages for those who can’t engage in the “mine is bigger and better than yours” game! At the southern end of Sardinia north east of Cagliari is the marina of Villasimius. It’s a great spot for a crew change before heading east. We had decided that instead of heading for Sicily that we wanted to see an active volcano. The Aeolians are a string of volcanic islands to the north east of Sicily. 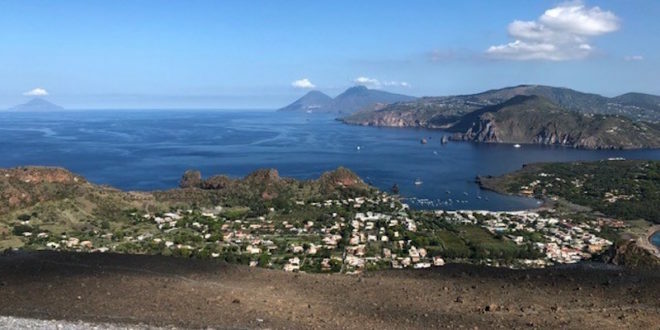 Stromboli sits at the northern end of the chain and has been mesmerising sailors for thousands of years. The Ancients used it as a waypoint on the way to Messina. We headed off in very light airs on what was going to be a 48 hour passage. The light wind was very frustrating and it seemed to take ages for Sardinia to disappear below the horizon. At 23:00 that night a fresh breeze came in from the south. We were soon cantering along at 8.5 knots in a perfect beam reach under full main and genoa. Citadel lapped up the miles in these perfect conditions. A breeze strong enough to drive Citadel along fast but just short of a wind that starts to drive spray across the boat. That night we took turns at sleeping on the comfortable cockpit cushions. There were no rude awakenings other than to be told it was once again my turn to be on watch. I fell asleep exhausted but mesmerised by the awesome starry skies in the pitch black sky. This environment is only now possible at sea well away from artificial lights. As dawn approached the wind dropped away and we were obliged to motor for the next few hours. This gave us a chance to re-charge our batteries so it was not all negative. In the early afternoon the island of Ustica appeared on our starboard bow and remained there almost until sunset as we sailed to the north. Ustica has a long and dark history as a prison island. It is just over half the distance to the main Aeolian archipelago sowe were soon into another night at sea. There were three crew aboard but only two were sharing the watches. The balmy conditions made the watches comfortable as we continued the practice of sleeping in the open cockpit. The next day at around noon Alicudi, the most westerly of the islands, came into view and during the afternoon we threaded our way past Filicudi and Lipari to drop anchor in the western anchorage at Isola de Vulcano. We didn’t go ashore that evening instead we tidied up the boat and prepared for “amphibious operations” in the morning. We had decided to climb to the rim of the crater at Vulcano. The island is really just one big volcano that still spews out noxious hydrogen sulphide. First thing in the morning before it got too warm and whilst the western slopes of the crater were still in the shade we launched the tender and headed for shore. Once the tender was secured we donned our walking boots and headed up the track to the rim. 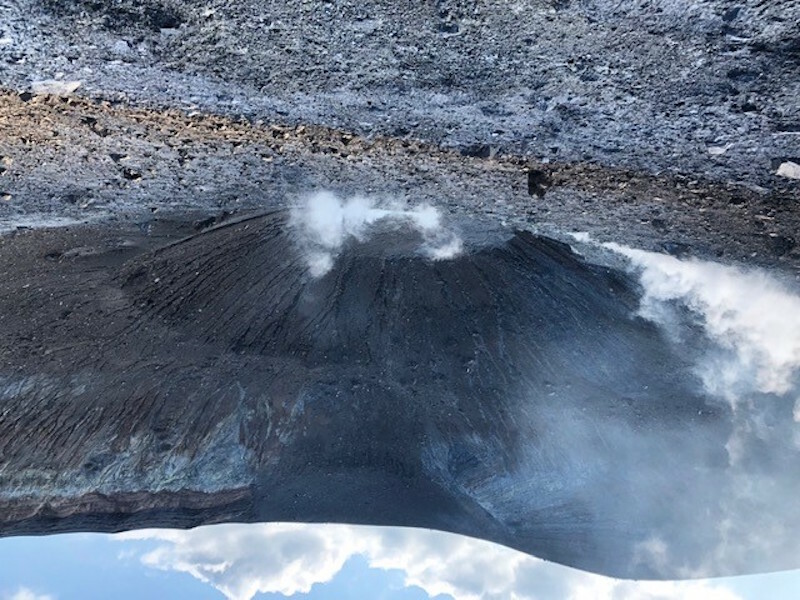 Every few hundred meters signs warned us about the dangers of the gases emanating from the fumaroles. One doesn’t climb up to the crater of a volcano more than a couple of times in a lifetime so we were not deterred. At the top, as well as the smoke emissions, we were rewarded with spectacular views of all the islands to the north and west. Stromboli was clearly visible. It was to be our next destination. It was soon time to descend to sample the hot and cold sea beach and more importantly to sample the granite (a uniquely lovely Italian Slush Puppy) and their gelatos. I realised that I was developing a dangerous addiction to the products of their lovely “gelaterias”! Next time I tell you about the how we drifted offshore to gaze at the eruptions at Stromboli. None of these islands have an airport. You can only to visit by boat. Find a suitable one for you at www.boatshedgibraltar.com.